Needless to say the holiday season was less than kind to my waistline, so I’m trying to cook a little healthier to drop some of those pounds. The other night I wanted a side dish that was flavorful, hearty and appropriate for the winter season, but that wouldn’t make me wince when I stepped on the scale the next morning, and this is what I came up with… a Vegan Winter Hash. In a small sauce pot combine the water, cranberries, sugar and nutmeg. Bring to a boil then reduce the heat to medium-low and simmer for 20 minutes to soften the cranberries and draw out some of their tartness. Put the cranberries (still in their liquid) in the freezer to cool for 30 minutes. Heat 1tbsp of olive oil in a large sauté pan on high heat. Add the diced sweet potatoes and 1tsp each of salt, pepper and garlic powder, sauté for 5 minutes. Then add the sprouts and 1tsp each of salt and pepper, sauté for an additional 5 minutes. At this point the potatoes and sprouts should have a light char. Drizzles the vegetables with 1tbsp of olive oil then place in the oven for 25-30 minutes, until well roasted. Stir periodically to promote even cooking. Remove the potatoes and sprouts from the oven and toss them with 1/3c of the cranberry water, then strain the cranberries from the remaining liquid and add them to the roasted vegetables. That’s it, you’re done… Hearty, delicious, and perfect for the winter. Serve it up and enjoy! 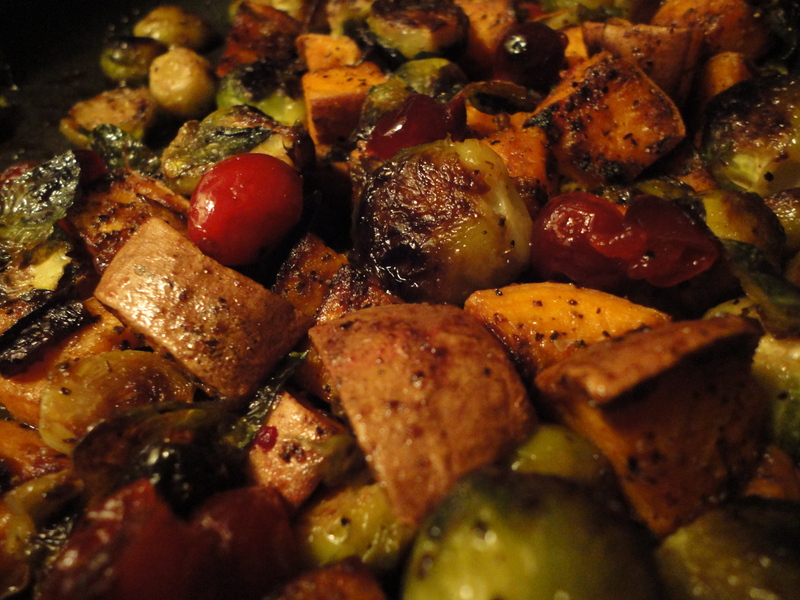 Tags: brussel sprout, brussels, cranberries, cranberry, hash, perfect pairings, perfect pairings at home, sprouts, sweet potato, vegan, vegetarian, winter. Bookmark the permalink. Previous post ← Homemade Pretzel Knots… perfect for a party! OH YEAH! This looks awesome as a main dish for me and a side for my omni family. Keep eating those fresh veggies and you will be in tip top shape in no time!